Started in Sydney, then moved to Melbourne, hidden in the basement of Little Collins Street and Equitable Lane… it’s Thai street food… cheap and with a big dining area for all group sizes. We arrived on a Sunday night asking for a table of 4. Told to wait for 10 minutes, but it only took us less than 5 minutes! I first ordered the Pandan Juice. I was expecting the drink to be green in colour, knowing pandan is usually green. But thankfully they didn’t, the less artificial colours, the better. It felt like syrup when drinking it, but it tasted so good! Great size for $3.90. We also tried Coconut Juice and Longan Juice. All are recommended. Keaw Tod Skewer, crispy wonton skin $3 (with chicken from memory) felt like most fried wontons, they were indifferent but still good for a snack. Friend, W specifically raved about their noodle soup. Such a good one to start on a cold winter’s night. We ordered the DoDee King Size pot, $29.90. Non-spicy with glass noodles. Beautiful. Their soup broth is distinct compared with other asian noodle soups. However, I’ve never tried any other Thai noodle soups to compare like for like. They sprinkled a lot of “crunch” in the soup – fried wonton skins, dried shrimps etc. 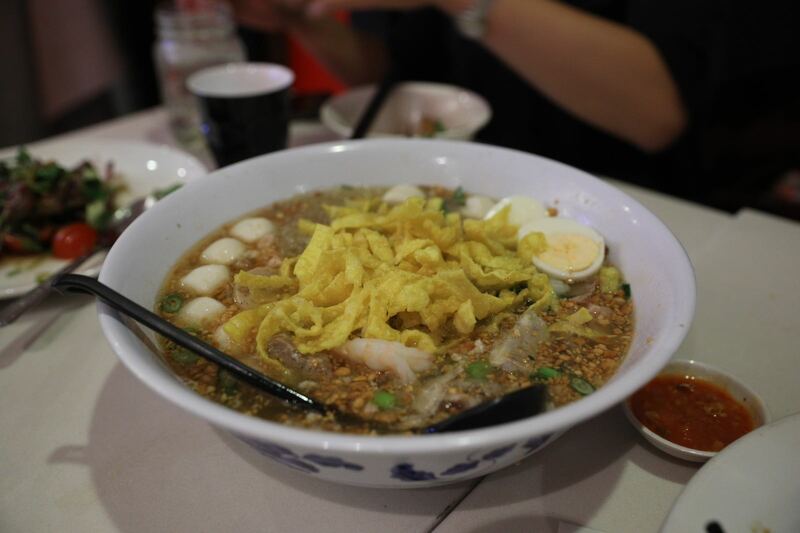 The noodle soup had a combination of various meat balls, egg and prawns. Like. Beef Salad, $16.90. I enjoyed this dish. I find Dodee Paidang is good with their beef and their accompanying sauce. A vinegary sauce with salad and onions are just simple combinations but delicious. Although, I felt this dish was a bit overpriced compared with their other dishes. Pad See Ew, $9.90. Great flavours from the wok. Nothing was burnt. For a good Pad See Ew, the star for me is always the veggies and the overall taste from the hot wok. Protein is usually secondary if they restaurant gets it right. It was good but have had better. Unfortunately, we didn’t have room for dessert. But I want to try their donuts, just because I love Thai donuts with pandan! Maybe add their mango rice pudding on the list too. Overall, I enjoyed the company and paying for good food for a cheap price for dinner. I just noticed they do $12 lunch deals (meal and a thai drink). Will definitely try it again! Worth a visit.